The Rebel Sweetheart. : Spring Fever Giveaway | Win a Stylish Satchel! My dear readers and followers, welcome to the Spring Fever Event, a giveaway hop hosted by Andersons Angels and Joy of Momma Joyner. 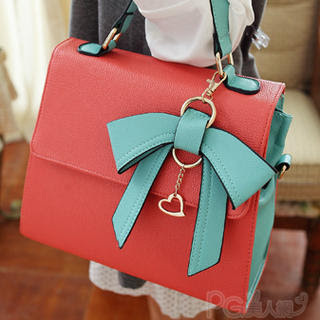 For this giveaway, up for grabs is this lovely Bow Accent Satchel from PG Beauty! A Taiwanese brand, PG Beauty encourages women to add a unique finishing touch to their look with its wide selection of versatile carryalls, attractive wallets and sophisticated handbags Established in 2003 by Zhuang Longlon, the brand currently operates over 20 retail locations in its native Taiwan. And for the people behind PG Beauty, living fashionably is all about having the right accessories and an attitude to match. This Bow Accent Satchel in particular, is one of the brand's best selling styles. And now, I'm giving one lucky reader the chance to strut in style with this chic satchel in tow! Enter the giveaway via the Rafflecopter below. Try to complete as many tasks as you can to gain more entries. This giveaway is open worldwide, and will run until March 15, 1159H EST. After you're done with my giveaway, please hop over to the other blogs listed below. These bloggers have prepared prize packages worth $25 or more just for you! Disclamer: The Rebel Sweetheart, Andersons Angels, and the Spring Fever bloggers are not responsible for sponsors that fail to fulfill their prizes. Designer Celine bags are the trendiest style for women nowadays; though expensive by brand. Thank you for the chance! hope to win! very nice giveaway,thanks for this. That satchel is so pretty, I speciallty love the bow! So thanks for this giveaway. The color scheme is nice for ladies and I'm sure a lot of ladies would join in this one. OK, so I'm not really a bag person and I'm really finicky about bags because I don't like them too fancy or sparkly or anything, BUT I LOVE THIS SO MUCH. Hope to win the new bag! Hey Czjai, this is a lovely giveaway!